I am delighted to be here in Jordan on the very first State Visit by a President of India. At the very outset, I would like to offer you warm greetings of the Government and people of India. I am accompanied by H’ble Minister of Social Justice and Empowerment, Shri Thawar Chand Gehlot, distinguished Members of the Indian Parliament, Vice Chancellors of eminent Indian Universities and senior officers of the Government of India. We have been looking forward to meeting you all. Although it is only a few hours since our arrival, I am sure I speak for my entire delegation when I say that our day has been memorable. The affection and goodwill that has been showered on us by the people of Amman since we arrived has made a lasting impression on us. Ambassador Trigunayat tells me that the Indian community and Jordanian friends, many of whom are present here today, have been playing an exceptional role in cementing the co-operation between Jordan and India. I would like to commend your efforts. I have been made aware that the Indian community in Jordan have always been made to feel welcome and comfortable here. I thank His Majesty, King Abdullah II and the Government and friendly people of Jordan for creating an environment that has enabled our people to flourish and whole heartedly contribute to the progress and development of this great nation. The Government and people of India, too, bear the greatest goodwill and affection for the people of Jordan and look forward to taking forward our relations in all areas of common interest. I would like to share with you that I have had very good discussions with His Majesty, King Abdullah II today. I took the opportunity to thank His Majesty for the humanitarian assistance extended by Jordan in the evacuation of Indians from Iraq in the midst of the Gulf Crisis in 1991 and then again in 2014 when they fled from the troubled situation in Iraq. 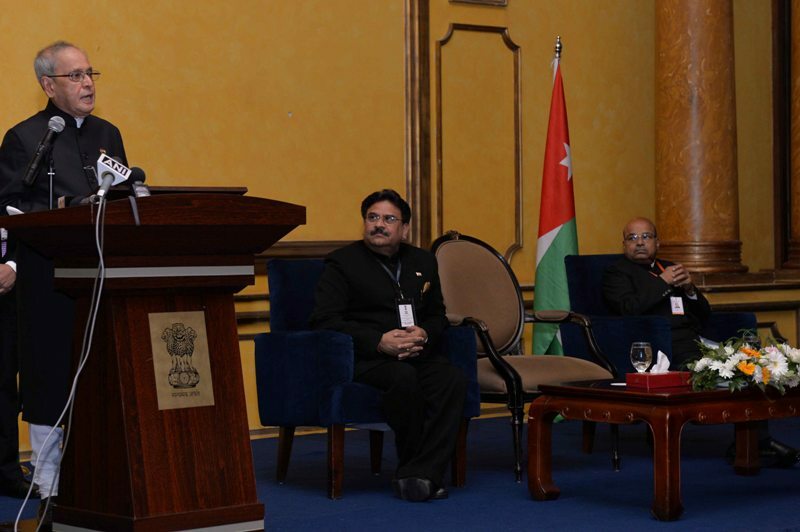 We, in India, greatly value the personal contribution of His Majesty and his Government to the enhancing of relations between Jordan and India. I am happy to say that my visit is taking place at a time when the Government of India has initiated a series of measures aimed at boosting the manufacturing sector in India, encouraging foreign direct investment and welcoming investors to participate in the development of India’s infrastructure. India is a fast-growing economy and expanding market. This is, therefore, an opportune moment for our two nations to identify synergies and build on them for the mutual benefit of our peoples. I will meet Prime Minister Dr. Abdullah Ensour and Deputy Prime Minister and Foreign Minister Nasser Judeh tomorrow. I will have the honour of representing the people of India at the naming of a prominent street after Mahatma Gandhi. This gesture is not only a tribute to the Father of our nation, but also a recognition of the enduring relevance of his universal message of peace and non violence. "It is the law of love that rules mankind. Had violence, i.e. hate, ruled us we should have become extinct long ago. And yet, the tragedy of it is that the so-called civilized men and nations conduct themselves as if the basis of society was violence”. Friends, like Jordan, India is a young nation. 65% of our population is less than 35 years of age. Almost 10 million young Indians join the job market every year. Both our nations are favourably placed to harness the unprecedented demographic dividend accruing to us. In order to create a conducive economic environment for achieving high and sustainable rates of growth over the next few decades, Government of India is focused on simplifying procedures, introducing greater accountability, enhancing informed decision making and rationalising our laws and regulations. I understand Jordan has also been taking similar measures to fulfil a similar commitment to its youth. However, even as governments implement facilitating measures, greater trade can be realised only if businesses on both sides participate wholeheartedly in this process. To this end, we, in India, are committed to furthering our ongoing co-operation with Jordan in areas of shared interest and complementarities. The MOUs and agreements for co-operation that will be signed during my visit will surely contribute to the efforts of our Governments in providing an expanded institutional framework for an efficient and result oriented engagement. I am happy to learn that large Indian business delegations have participated in Trade fairs in Jordan and after the recently held Joint Commission meeting; the first Indo-Jordan CEOs Business Forum will be held in New Delhi later in the year. Our bilateral trade has crossed the USD 2 billion mark in 2014. In fact, our total non-oil bilateral trade which was a mere US $ 570 million in 2006 has doubled to US $ 1.89 billion in 2014. We have set a target of 5 billion USD of bilateral trade by 2025; which I believe is eminently achievable. India has emerged as the 4th largest trading partner of Jordan and is one of the main importer of rock phosphates, potash and finished fertilizers from here. The state of the art JIFCO Joint Venture project is an example of our successful collaboration. I have been told that Jordan is keen to see greater participation of Indian companies in a variety of areas such as transportation, Renewable Energy, IT and IT enabled services and Pharmaceutical sectors. I would encourage Indian investors to consider these avenues of cooperation. India’s initiative to extend the " E-Tourist Visa” facility to Jordanian nationals since last November is based on our commitment to increase tourism flows between our nations and encourage people to people contacts. We look forward to your full support and contribution to towards this end. With these words, Ladies and Gentlemen, I wish to reiterate how delighted I am to see your optimism and commitment towards reinforcing the ties between India and Jordan. I wish you success. I once again thank you and offer you my best wishes and those of the Indian people for your continued happiness, progress and prosperity. Thank you! Shukran Jazeelan. Jai Hind.